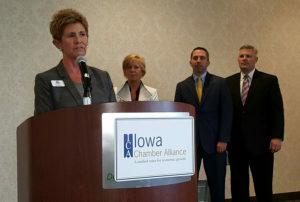 Tara Barney (at podium), Quad Cities Chamber of Commerce; Molly Grover, Dubuque Area Chamber; Jason Hutcheson, Greater Burlington Partnership; Chris McGowan, Siouxland Chamber of Commerce. A group representing chambers of commerce and economic development organizations in Iowa’s 16 largest cities issued its annual “wish list” for the upcoming session of the Iowa Legislature. Jason Hutcheson, chair of the Iowa Chamber Alliance (ICA), says one of his group’s top priorities is tax reform. Hutcheson is also the President and CEO of the Greater Burlington Partnership. John Stineman, executive director of the ICA, says one possibility to simplifying Iowa’s tax system might involve eliminating federal deductibility. “It does definitely complicate our tax code,” Stineman said. “What’s important there, however, is if we are going to move a way from federal deductibility, we do so in a way that does not inadvertently raise taxes, because right now that federal deductibility does have a net decrease on Iowans’ tax bill.” Currently, Iowa is one of a handful of states to permit tax filers to deduct all tax payments made to the federal government in calculating their state income tax liability. Chris McGowan, with the Siouxland Chamber of Commerce, says another priority of the Iowa Chamber Alliance is a “statewide-only” minimum wage. “Any adjustments to the minimum wage should be done at the state level, not by local government entities,” McGowan said. McGowan is vice-chair of the ICA. Stineman said, for now, the ICA is staying “neutral” on the idea of a hike in the statewide minimum wage. Instead, the group is only calling on the legislature to halt the patchwork of local rates that are higher than the current state standard of $7.25 an hour. The Alliance is also calling on the legislature to develop “forward-looking” programs to encourage entrepreneurship and attract investment, while creating a “predictable and responsive” regulatory environment. The 2017 Legislative Session begins on January 9. Republicans will hold a majority in both the Iowa House and Senate over the next two years.